The council of ministers of Somali state in Ethiopia is holding an emergency meeting at the presidential palace which is underway. According to reliable sources in Jigjiga, the seat of Somali State government confirm that there is a fallout between Ethiopia’s Federal Gov’t and the Somali State president, Hon. Mustafe Mohumed Agjar which is getting from bad to worse. The regional president is feeling a lot pressure which is demanding his resignation. The council of ministers are having discussions on the situation that is has unfolded and will issues a statement shortly. Ethiopia’s Finance minister, Hon. Ahmed Shide is spearheading unprecedented efforts which is calling the incumbent Somali State president to tender his resignation as a row broke out between him and Mr. Agjar. Mr. Shide, Ethiopia’s finance minister wants a puppet leader who is willing to listen to him to replace Mr. Agjar. The Somali State government is facing a period of uncertainty and this transpired after the incumbent president was ordered to come to Addis Ababa, the capital of Ethiopia. 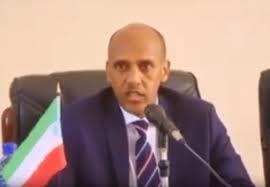 The skirmishes between Oromo and Somali clans is the bone of contention has impacted the administration led by Mr. Agjar.